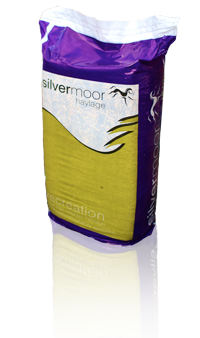 Silvermoor Recreation Haylage is a forage tailor made for horses from rye grass mixes which have been developed over the last 10 years to provide a lower protein and energy forage. Designed to be suitable for all types of horses and ponies, from native breeds, right up to Lenamore the Burghley Horse Trials 2010 winner. ‘Recreation’ often provides all the nutrition your horse requires from its forage, it is cost effective, dust free and fully traceable, making it the natural choice of forage for your horse. Recreation is also suitable for native ponies and lamanitics or those with the potential to suffer from laminitis and horses at rest; providing hard feed and management are adjusted accordingly, due to it’s higher fibre lower protein and energy content. ‘Recreation’ is highly palatable so is great for fussy feeders, meaning less waste. Recreation is available in easy to handle, weather proof 20kg packs. Once opened the haylage will last for approximately 5 days and unopened have a shelf life of 9 months.